President Donald Trump’s national security adviser, Michael Flynn, resigned from his position on Monday night after it was reported that he met with Russia’s ambassador to the United States, Sergey Kislyak. “Unfortunately, because of the fast pace of events, I inadvertently briefed the Vice President Elect and others with incomplete information regarding my phone calls with the Russian Ambassador. I have sincerely apologized to the President and the Vice President, and they have accepted my apology,” Flynn said in a resignation letter. Flynn apparently discussed U.S. sanctions with Kislyak before Trump took office. 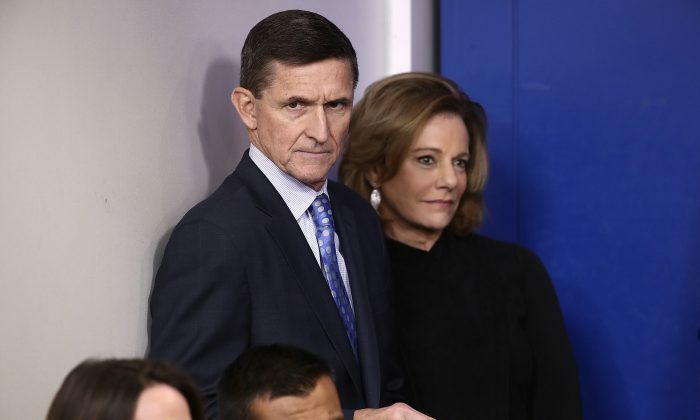 It is illegal for private citizens to conduct U.S. diplomacy, and Flynn is said to have misled other Trump administration officials about his phone call. After it surfaced that Flynn may have violated an obscure 1799 law known as the Logan Act, hysteria on social media and in the legacy media began brewing. In more than 200 years since it was passed, no single person has been prosecuted under the act. White House counselor Kellyanne Conway on Tuesday suggested that Trump was “very loyal” to Flynn and Flynn then “decided it was best to resign” because he was drawing too much scrutiny, she told NBC News. Republican Rep. Devin Nunes of California, the chairman of the House Permanent Select Committee on Intelligence, said in a statement that he thanked Flynn’s years of service. “Michael Flynn served in the U.S. military for more than three decades. Washington, D.C. can be a rough town for honorable people, and Flynn—who has always been a soldier, not a politician—deserves America’s gratitude and respect for dedicating so much of his life to strengthening our national security. I thank him for his many years of distinguished service,” he said. Immigration officials arrested more than 680 illegal immigrants in the last week, compared with an average of 1,336 per week in 2015.